Are you a blogger / digital marketer / sales professional? Here you will learn how to find the email id’s of prospects with Snov.io, the best email finder tool I’ve used. If you have spent a few years in digital marketing, you probably know that “email marketing” is the most reliable digital marketing technique that frequently brings the best ROI. It is believed that for every $1 you spend on email marketing, you will get a ROI of $44. 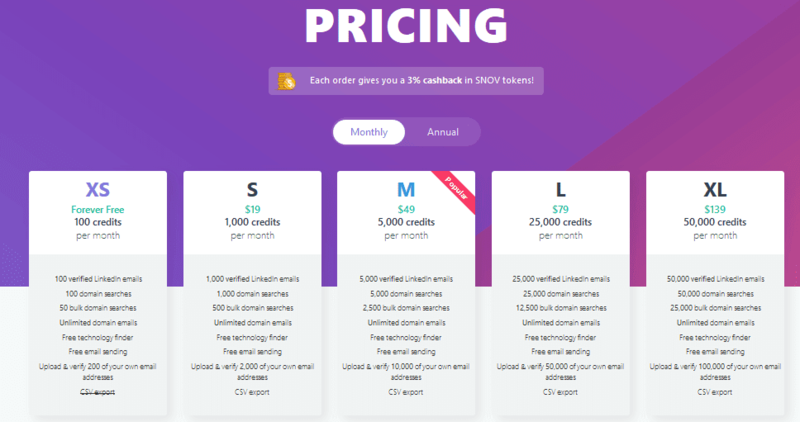 I encourage every blogger, marketer and sales professional to try Snov.io – The leading email finder tool on the Internet. It is a simple yet powerful all-in-one solution for all your email id finding needs. Email marketing will help you directly reach out to your potential customers. You can always personalize the email. In a nutshell, you can use email marketing to promote your product or service easily. But the question is where can you get the potential customer’s email id? Of course, you can collect the email ids from your website/blog, but that won’t happen overnight. At SolveMyHow, it took 4 years to create my email list of 17K+ email subscribers. But you may not have 4 years and you want the data right away to generate business, right? You just need the correct email id of any prospect, their website, and profile. There are 100s of scenarios where you will be in need of someone’s email id. In this post, we will see the step by step solution on how to find the email address you need using the best email finder tool - Snov.io. A) You can install the Chrome extension and use the awesome features of this tool. B) You can visit the website and use it from the dashboard. Snov.io has a great dashboard and you will just love using it. So, just to get started you can go ahead and install chrome extension of which I’m a very big fan. Then you can visit any website you want to find the email address from and simply open the chrome extension to get email addresses associated with the site. 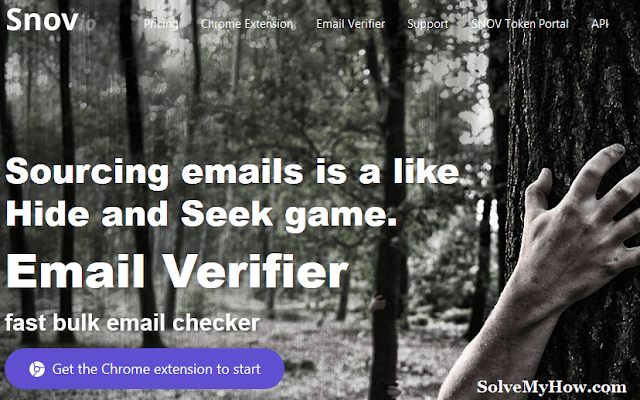 This tool will not only help you hunt the email address but it will also help you validate email addresses and also let you send the emails for FREE. Let us look at more of Snov.io’s features. Below I’ve mentioned the best 3 Snov.io features. Let’s get started. Domain search feature is the most unique feature of this tool and is not provided by any other email finder tool. That’s great Piyush, but how do I use this tool. To use this feature, you must be signed up with Snov.io and logged into your account. Now open any website/company’s website from which you want to find the email address. After doing that, click on the chrome extension and you will see all the email ids mentioned on that blog/website. Below is the example of SolveMyHow.com domain. Do you have an email list of prospects and you are about to run an email marketing campaign? You are in big MESS! No matter what email marketing tool you’re using, whether it’s MailChimp or ZOHO, if you have a high bounce rate your account will get blocked. So, before shooting off any email marketing campaigns, you can use an email verifier tool. Here you can simply upload your email id list and this tool will tell you which email ids are active and which are fake email ids. This will not only save you from being blocked, it will also help you save your email credits. Imagine - what if you’re in need of freelancers, data researchers, marketing experts or employers? Well now simply open Snovio Marketplace and create your request. They will automatically find you. This is the best freelance system where any type of marketing task can be completed i.e from finding talent to writing email sales copy. Now, let us look at how much this amazing tool costs. If you are an individual looking for the best email finder tool that finds the email ids of prospects, you can use the fully functional freemium version of this tool. But if you’re a team and if you’re in need of more credits to get your work done then definitely go for the premium version of this tool. Which is very affordable as the prices in the above snapshot show. So, this was all about Snovio - the best email finder and email verifier tool for marketers and sales professionals. I hope this tool solves your problems of finding the email ids of prospects. The Email Verifier is the most amazing tool I’ve ever seen. It will definitely help you to save your email credits and also protects you from getting blocked. Install the Snovio chrome extension right away. It won’t cost you a single penny. You can also subscribe to SolveMyHownewsletter to get the latest updates about email marketing, sent right to your inbox!